Balmond is an engineer, designer, master builder, mathematician, thinker and writer. His theory of the informal is grounded in his collaboration over the last 25 years with many notable architects including Rem Koolhaas, Daniel Libeskind and Alvaro Siza. This is the first definitive account of his investigative engineering approach, an exploration in the art of configuration. Architecture is portrayed as a formative process developing from a seminal structural logic, creatively researched beyond the limits of conventional orthogonality. It is a search for the magic in making a form, using numbers, music and mathematics as vital sources. What comes through ultimately is that the lyric or elegiac is always present, even in that hardest of pursuits to make a building take shape, defy gravity and be pragmatic. informal captures this essence, that beyond craft and technique there is art and poetry. The book invites the reader to enter the dialogues between the author and the architects he works with, sharing the intimacies of the design process through sketches and first principles. Cecil Balmond’s theory of the informal is explained with reference to 7 seminal projects in collaboration with architects Rem Koolhaas, Daniel Libeskind, Alvaro Siza, Ben van Berkel, and Peter Kulka with Ulrich Königs, ranging from a Villa in Bordeaux to a large Transport Interchange in Arnhem; from a large canopy in Lisbon to the V&A Spiral in London and an Exhibition Centre in Lille. The book, created with Jannuzzi Smith, presents Balmond’s unorthodox ideas through a series of interlinking stories, in which anecdote vies with analysis, science with art. This approach enables each story (or chapter) to focus on a particular aspect of Balmond’s problem-solving methodology without replicating the already well-documented perspective of the architects on each of these iconic projects. Stories relating to each project are dispersed throughout the book, each free to graphically explore its own theme. Counterpoint comes from placing different projects alongside each other. Pace, tone and emphasis vary to suit content. Design is inspired more by mathematics books and children’s fiction than by books on architecture or engineering. Each project has a ‘signature’ colour, thereby visually reuniting the different stories. The contents page and cover use these colours to map the rest of the book. Underpinning the whole is a typographic treatment designed to relay the simple elegance of Balmond’s ideas, and to retain the flow of words and doodles of his hand-written manuscripts. Conventional left, right or centred text settings were abandoned in favour of an ‘internal alignment’. This allows drawings, photographs and documents to be interwoven, and softens the hard right angles of the book. 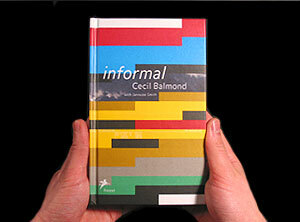 informal has recieved an award by Stiftung Buchkunst as one of “Die schönsten deutschen Bücher 2002”. “I was introduced to Michele Jannuzzi and Richard Smith” Balmond says, “as people who would help me resolve a difficult problem – how to communicate the essence of something.” The results of this collaboration – a seamless innovation of text and image – mirrors Balmond’s own creative collaboration with leading architects, a blurring of the boundaries between one discipline and another. Balmond (adjacent picture, left) was born in Sri Lanka, where he studied at university, before leaving for further education in England. He is Saarinen Professor at Yale, was Kenzo Tange Visiting Critic at Harvard, is a member of the Arup Group Board, and Chairman of Arup’s Europe Division. He was recently appointed a Fellow of the RIBA and was awarded the honorary Diploma of the AA. Recent projects include the Serpentine Gallery Pavilion with Toyo Ito, and the largest fabric sculpture in the world with Anish Kapoor, recently opened in the Turbine Hall at Tate Modern. Balmond’s first book Number 9: the Search for the Sigma Code was also published by Prestel (1998). 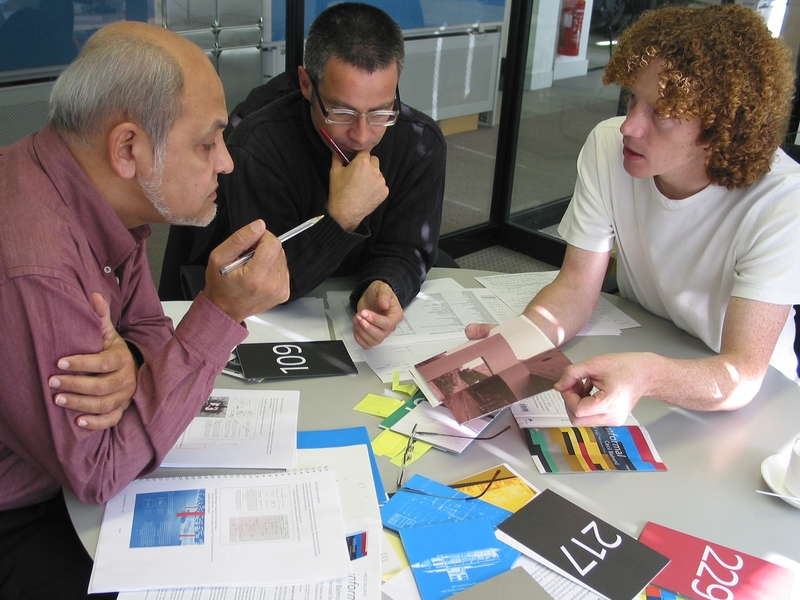 Michele Jannuzzi and Richard Smith (adjacent picture, centre and right) are the directors of cross-media design consultants Jannuzzi Smith, and authors of dotlinepixel published by GCE, Mendrisio (2000). They are graduates of the Royal College of Art in London. Published by Prestel, 2002 (ISBN 3-7913-2400-4). Edited by Christian Brensing, with prefaces by Charles Jencks and Rem Koolhaas. Additional information about the book and downloadable resources for review purposes are available here. Please note that the following resources are supplied for review purposes only. Normal copyright laws apply. Requests for additional material, further information, or sales should be directed to the publisher (sales@prestel-uk.co.uk).